Region: This fly is found throughout most of North America. Life cycle: This insect produces two to three generations each year and hibernates in the soil as maggots or pupae. 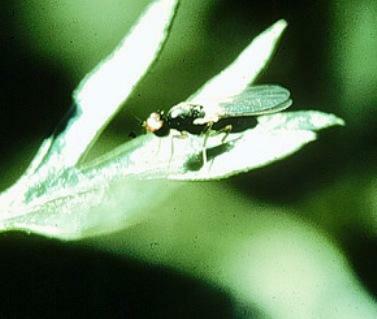 Physical Description: This 1/5 inch long fly is black or green with yellow hair, legs, and head. The eggs or laid in the crowns of plants and hatch larva that are yellowish white, legless, and grow up to 1/3 inch long. Feeding characteristics: This pest will attack carrot, celery, parsley, and parsnip plants by chewing roots and leaving reddish brown excrement in their tunnels. The plants may be stunted, and the infestation leads the way for Soft-Rot bacteria. Controls: To prevent maggot infestations, put used tealeaves in with the carrot seeds. If rotating your crops is not sufficient, skip the early planting and plant in early summer. By this time, the maggots have died from starvation. If you choose to do this, postpone your celery crop also. The maggots will survive quite well until the carrots appear. In New York, and similar climates, crops planted after June 1 and harvested before September, escape the maggot. The second brood hatches in the fall. To repel the fly, sprinkle Rock Phosphate or pulverized wormwood around the base of the plants. This will discourage the fly from laying eggs on the plant crowns. You can also repel the fly by planting certain plants adjacent to your carrots. Leek, onion, pennyroyal, rosemary, sage, black salsify (or oyster plant), and coriander all repel this insect.